While the word emergency can be quite scary and an unplanned caesarean isn’t the choice of birth for any mother; emergency c-sections are quite common these days. Here’s everything you need to know about when you might need one and what the surgery involves. 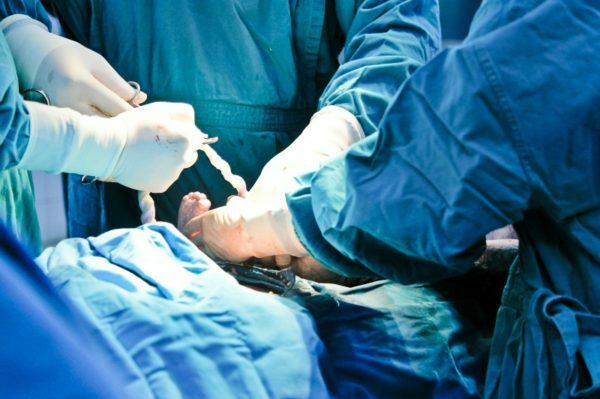 A caesarean or c-section is when a pregnant mother’s baby is delivered via an operation in which doctors cut open her abdomen and manually remove the baby from her uterus. An emergency c-section works pretty much the same, however, it’s an unplanned decision made quickly by medical staff in what’s considered an emergency situation where the health of the baby and mother is at risk. Emergency c-sections usually occur when labour has already commenced, and complications arise. However, in rare instances, the urgency to deliver a baby is due to a sudden and fast deterioration in the mother’s health, which then requires immediate action to give both the baby and mother the best chance possible. Pregnant women who are induced are also more likely to result in emergency c-sections due to the sudden onset of strong contractions, additional assistance such as hormone drips and epidurals, and the baby perhaps not being quite ready to come out. What is vaginal seeding and how can it help babies born via c-section? After your doctor has advised you that you’ll need an emergency c-section, you’ll be given a ‘shower cap’ to put on your head and prepped for surgery. A catheter will be inserted (to ensure an empty bladder during the surgery), a spinal anaesthetic or epidural given (for which you sit on the bed, and they insert into your back) and a drip put into your arm. You’ll then be wheeled into the operating theatre along with your birthing partner (who can stay with you the whole time), and a screen placed above your belly for hygiene reasons. In the room, there’s usually your doctor, their surgical assistant, an anaesthetist and one or two midwives. Your lower tummy will be cleaned with disinfectant and possibly shaved (if there is hair in the way), and then once they’ve checked that the anaesthetic has worked, they will perform two incisions in your abdomen and uterus to allow them to lift out your baby. You will feel this via tugging sensations, and if the baby has descended, they might require forceps to bring the baby back up. Some hospitals actually have camera TVs where you can see your baby being born – if you wish! In a severe emergency where it’s vital that your baby is born immediately, a general anaesthetic will be used – so you’ll be asleep when your baby is delivered. This is rare, however, and in most instances, you are wide awake and able to be part of the whole process. Once the baby is born and the cord cut, a midwife will give her a quick wipe and weigh before placing her by your head and chest for a look and some skin-to-skin contact. Then while the placenta is delivered and you are sewn up, your birthing partner or the midwife will usually hold your baby. All up the c-section process usually takes no more than 30 minutes, and if all is well, you will soon be reunited with your baby in your hospital room where you can have a proper cuddle and commence nursing (if you intend to breastfeed). Like with any operation, there are risks and complications which can occur with emergency caesareans. Although uncommon, they can include reactions to medications, excessive bleeding, infections, blood clots and injuries to the baby or mother. Recovery is also a bit longer for a c-section delivery – especially one that’s an emergency or that had complications. It might take an hour or so to get the use of your legs back and your catheter usually won’t be removed until the following day, so getting your bladder and bowels functioning properly again could take a few days. Your stay in hospital will be a few days longer than vaginal delivery (around 5-6 days) to give you more time to heal, and you’ll be given strong painkillers both there and for when you leave. When you return home, you won’t be able to drive, lift anything heavy or exercise for around six weeks. While this doesn’t sound great, it’s very important that you take it easy and allow your body to recover. Getting loved ones to help with chores, eating nutritious food, gentle walks and getting plenty of rest are all great ways to help speed up your recovery. Many mums can also feel quite emotional about the fact they had an emergency c-section, especially if they were hoping to give birth in a specific way (such as naturally or in the water). It’s important to remember that there was a reason for the operation. Try to take comfort in the fact that both you and your baby are safe and healthy, and that many women have undergone birth the same way. Before you know it, you’ll be back to your usual self – aside from the addition of a small horizontal scar below the top of your undies (which does shrink and fade). Think of it as a nice little reminder of the fact you’re now a mum! If you had an emergency c-section and aren’t coping emotionally or physically, please speak to your doctor.